ChumMe, like most apps, began as a solution to a modern day problem. How does one meet new people - people who have common interests? There is no shortage of dating apps and websites, but there is not a singular answer to make friends, meet neighbors and connect with new people. ChumMe is just that - an app to make friends. The venues for people to meet are typically tied a specific event (e.g. MeetUp). Other sites have a hidden agenda, where you never know ones true intentions. ChumMe brings people together to make the world a smaller place. There are people out there who share your interests, your background, your educational pedigree...but no where to connect - until now! With ChumMe, you will be able to find individuals who live close to you. The biggest road block in hanging out with friends is typically proximity. Wouldn't it be convenient to get to know people within a close radius to do the things you like to do? Grab some coffee. Watch the game. Play a game. Start a book club. Go for a run. The possibilities are endless. ChumMe also allows you to find people with similar interests by sorting on relevance. Whether you want a partner in crime to be your wingman, or someone to simply have dinner with, perhaps join you for a movie, ChumMe allows you to find people out there where you actually have something in common. You can filter your results based on interests so you can message someone who is interested in the same things as you. Who is the perfect person for ChumMe? Everyone. Whether you're a transplant from another city, or your friends all have their own agenda, anyone looking to expand their social network will find a great tool in ChumMe. ChumMe is for making platonic connections. As we ring in 2016, we are proud to announce that ChumMe has gone into development. 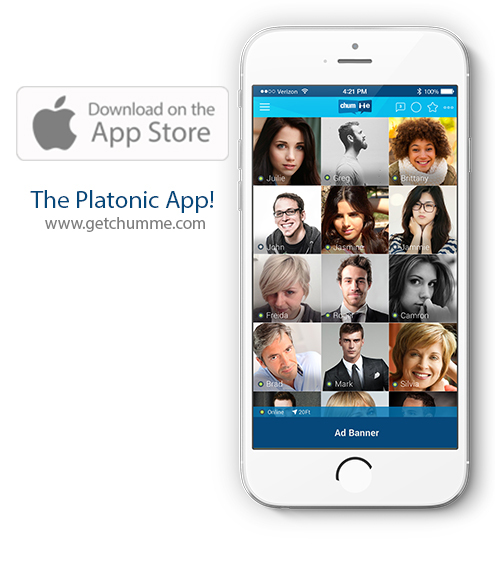 The revolutionary platonic app will launch first on iOS and then on Android shortly after that. The markets where the launch will take place is yet to be determined. Think you live in a city where the app would be useful? Suggest it by reaching out to ChumMe on our contact page. Thanks for being part of the story.